Small, autonomous, electric powered buses are presently being tested in various cities throughout the world. As usual the United States and Canada are well behind much of the world in the testing or the actual implementation of self driving vehicles. 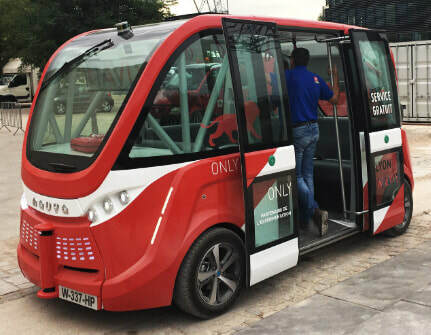 Switzerland, Singapore and London's Heathrow Airport have had autonomous buses in operation since 2016. These buses can ‘bridge the gap’ between the major ‘people movers’ such as subways, to help get people nearer their final destination. I’m certain they are the way of the future. The buses can be used on college campuses, such as at the University of Michigan, and in neighbourhoods where the buses slow speed is an asset. In these test situations the buses are limited to 24 kph but as the technology improves in the future the buses will easily and safely reach the 40 kph maximum on most residential roadways. I think these buses will serve residential communities far better than massive streetcars or the dirty diesel buses. I think Toronto’s Beaches community would be an excellent starting point for this service. 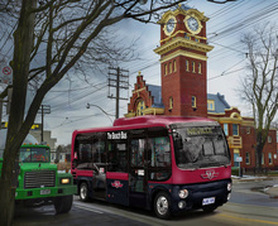 The route would follow Queen Street East beginning at Kingston Road and ending at the Neville Park transit loop. Here the “Beach Bus” can re-charge its batteries. It will stop at current transit stops if a rider presses a button at that stop — otherwise the bus would ignore the stop. A cell phone app can also be used to hail the bus on its normal Queen Street route. 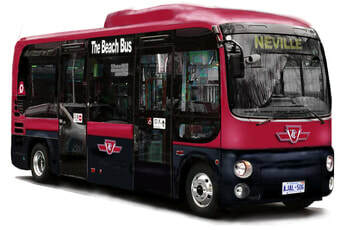 I estimate the “Beach Bus” will require 20 minutes to travel each way stopping for one minute at each of the designated stop points. A fleet of 5 buses would be sufficient which would correspond to a maximum waiting time of 10 minutes. The “Beach Bus” will also have the potential to expand to service side-streets which would better serve the elderly and handicapped in the community. The small size of these vehicles will present no problem in navigating these areas. I would suggest that one bus should be purchased by the commission for testing over one year period – which would, hopefully include a snowy winter, before going ahead with the full 5 bus purchase implementation. Video monitoring of the bus network would be required 24/7 which would include 3 full time technicians. ​I see no reason why a bus such as this can't be developed and built right here in Canada. I would not ask Bombardier to quote on this project however. A new start-up concentrating primarily on the “Beach Bus” is worth serious consideration. Most of the day the small passenger capacity of these buses will suffice. In fact this small bus would be far more practical at all times of the day except during the morning and afternoon rush hours. Then it would just require more buses in operation. Right now massive and noisy streetcars carrying a couple of passengers after midnight doesn’t make a lot of sense so small electric buses may also save on transit costs to the city. Designed and built by the French company EasyMile, the EZ10 bus is currently the most impressive autonomous bus yet developed in my opinion. It features 4 wheel steering and can drive in either direction so it does not require a loop to turn around. 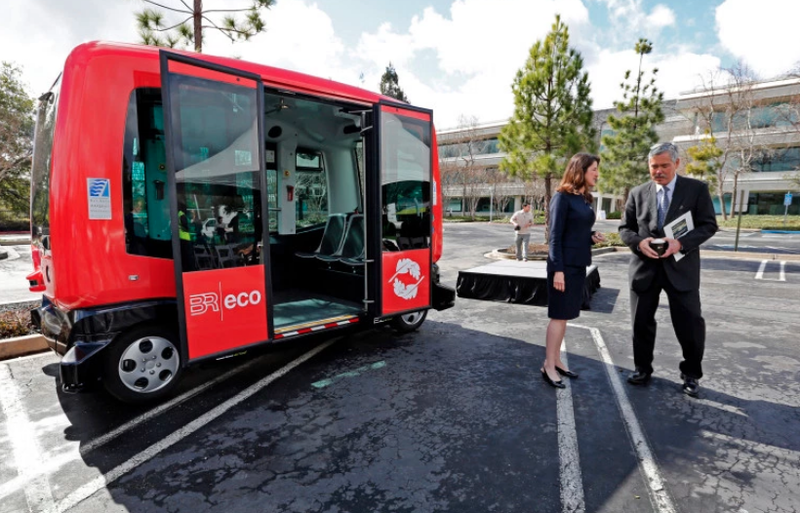 Recent California legislation has permitted the EasyMile buses to be the first driverless vehicles allowed to operate on public roads during a pilot program taking place by the end of 2017. The company is testing the buses in 14 other countries as well. It seats 6 people and is wheelchair accessible. It can also accommodate 6 standees. I feel that this vehicle is a bit small for large roads like Toronto's Queen Street. However I do believe this size would be ideal when the system becomes "direct to door" but many vehicles will be required. Here is another autonomous bus from France. 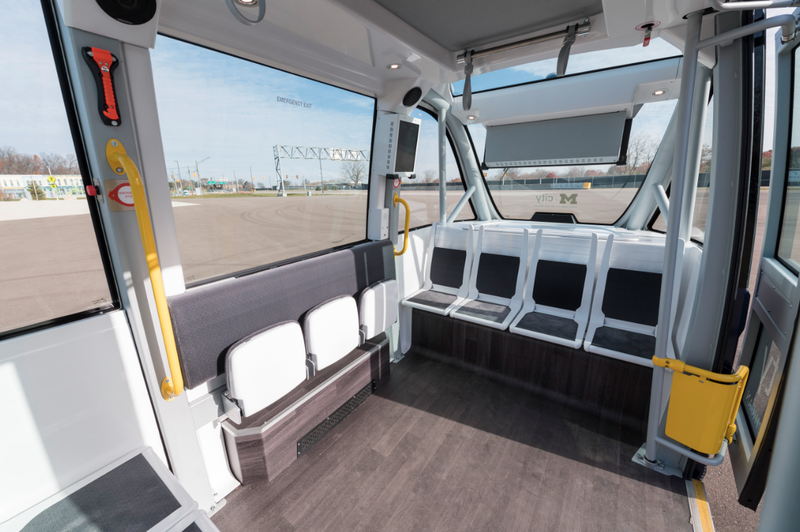 The Navya is larger than the EZ10 as it seats 15 people. The company has autonomous vehicles on the roads in London and Las Vegas. I think this vehicle is the ideal size if it is used on the main neighbourhood roads such as Queen Street. Whether it can be used for "direct to door" service on residential streets needs to be tested in actual use. This is the Navya interior which seats 15. ​Why aren’t we involved in something like this? ​Toronto’s previous transit CEO Andy Byford, who will be moving to New York soon, says that it’s smart for the transit commission to take a “wait and see approach.” and goes on to state that “The TTC has in the past had its fingers burnt by getting in at the early edge of technology,” he said, citing the fleet of hybrid buses that the agency rolled out in 2008. “The vehicles have turned out to be much less reliable than regular buses”. 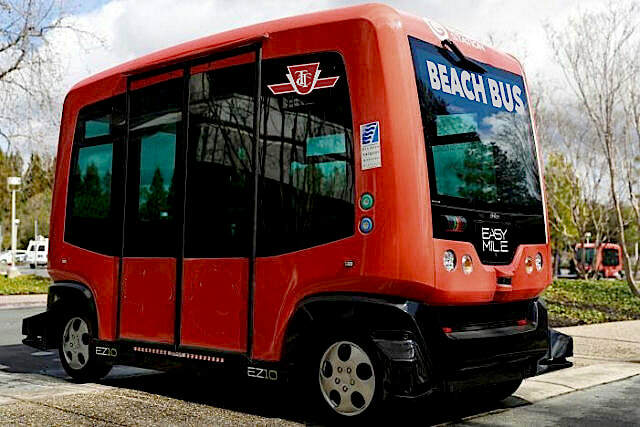 The problem I have with this comment is that a pilot project, like the “Beach Bus” is altogether different than ordering a large proportion of the city’s bus fleet using new, insignificantly tested technology. There can be risk – but there can be a missed leadership opportunity as well in at least testing the new technology. We are so risk adverse in this country. ​HERE is a study that concludes that using autonomous buses such as the EasyMile EZ10 would be costly compared to operating a small gas powered bus/van. It should be remembered that this is new technology and the costs reflect this. In the near future a bus like the EZ10 will be very cheap to build so costs will be significantly lower than the old driver/bus system. The article states that “Certainly this is not yet the low-cost mobility solution that advocates of autonomous vehicle have been predicting. But the technology is still years from maturity, and pilot programs present an opportunity to nudge communities like Arlington towards increasing their mobility options for residents”. I agree. I also noticed that the piece doesn’t mention that comparing new battery vehicles to dirty fossil fuel burning vehicles misses half of the point of moving to the newer technology. We need to move away from gas and oil. ​Here is my original 2015 mock-up of a small public transit bus that could serve residential neighbourhoods such as Toronto's Beaches at the eastern end of the Queen Street transit line. I would have the current Queen Street streetcar terminate at a new traffic circle loop at Kingston Road and Queen. The Beaches community is the perfect testbed for an initiative such as this. The current streetcar loop at Kingston Road can be used in the interim and a few of the new busses could be put into service between 1am and 5am. This kind of vehicle is much less obstructive and very quiet and is now in service in many parts of the world such as Tokyo. 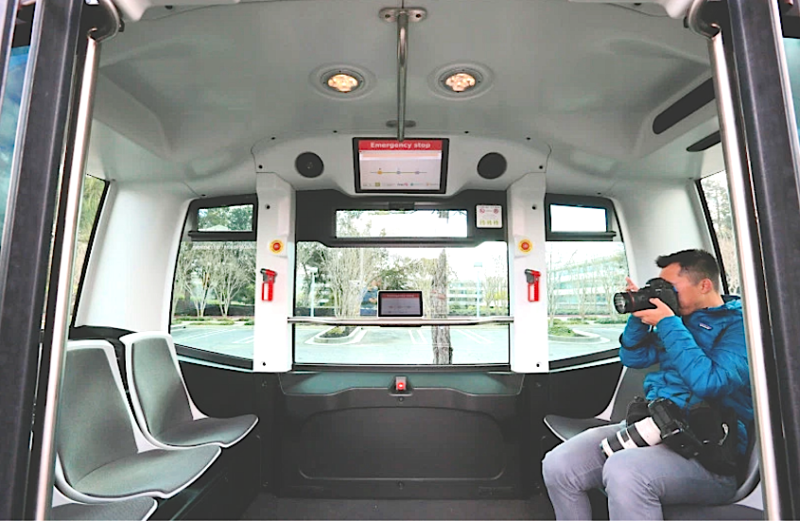 Small buses are also used as a shuttle at many airports, This will remove the massive and noisy streetcars from residential areas. It will also have the potential to service side-streets which could better serve the elderly and handicapped in the community. Here is an example of what I feel is an appropriate vehicle. It is the Hino Panchoo which is a modern low floor minibus designed and built in Japan and is currently in service. I see no reason however why a bus such as this can't be developed and built right here in Canada. I would suggest that a single Hino Pancho unit could be purchased for testing but I don't believe a left hand drive model is available so the doors would be on the wrong side of the bus. Yes, a few more bus drivers will be required during rush hours but that is not a bad thing in that it would provide well paying jobs. ​However at most times the small passenger capacity of these busses will be adequate. So a small bus would be far more practical at all but those busy rush hours. Massive streetcars carrying a couple of passengers after midnight has never looked practical to me. Welcome to my city planning blog where I post some of my ideas for making cities better. This city needs Roundabouts, it's about time. Visit my Architecture page where I discuss architecture in Toronto and elsewhere.